The Danish Government has established and funded the National Council for Children to advocate involving children and adolescents in decisions that affect them. The Council supports the Danish parliament, politicians and authorities in developing effective policies for young people. “Many adolescents already have life experience that the professionals need to hear to develop changes, if only they would listen to them instead of thinking they, the professionals, are the experts. Very often these kids have some great suggestions on how to help them get back on the right track,” says Trine Nyby, head of the Research and Analysis Unit at the Council. 5–15% of Danish young people are estimated to be in vulnerable situations. Some have already dropped out of school, had psychiatric problems or grown up in violent homes. The National Council for Children facilitates work with groups of at-risk young people and shares their suggestions on how to make their lives healthier and more secure. The Council established a Children and Youth Panel of 2000 adolescents selected to comprise a representative sample of the national population. They fill in questionnaires at school twice a year for 3 years. Teaching staff facilitate the process. The questionnaires cover current themes on the political agenda, such as how children and adolescents experience the economic crisis, parents’ divorce, the school environment and life in general. The results are presented to decision-makers to enable them to make policies sensitive to issues raised by the young people. allowing them to participate fully in meetings between parents and representatives of the social services. Looking at a given situation from the child or adolescent’s perspective is key. Involving children and adolescents in policy-making is a key issue in WHO/Europe’s new strategy: “Investing in children: the European child and adolescent health strategy 2015–2020”. Current information systems across Europe do not permit users to discern the experience of children from age 5 to adolescence. This blinds policy-makers to the burden of illness in young people and to the dangers and inequities that they face. Many information systems treat young people as add-ons to households, so their health experience before they reach voting age is difficult to discern. Children growing up in institutional care are particularly invisible and vulnerable. Thus, young people often fall through the cracks in policy-making and resource allocation. 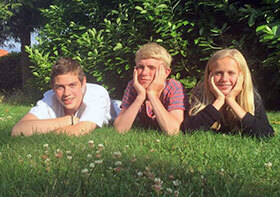 The Danish National Council for Children is an example of how to give children and young people a voice. “There is an increased focus on how to involve and listen to children and adolescents. It is important to stress that this interest must come from all levels in the organizations that are involved with young people. It has to be a priority. All it takes is for people to recognize that better solutions and better decisions are made when you listen to those who they concern the most,” adds Trine Nyby.